What does the slope mean? How does the slope relate to the “grippiness” of the two surfaces? Then we repeated the experiment with our shoes to determine the “grip factor” between our shoes and the tile. 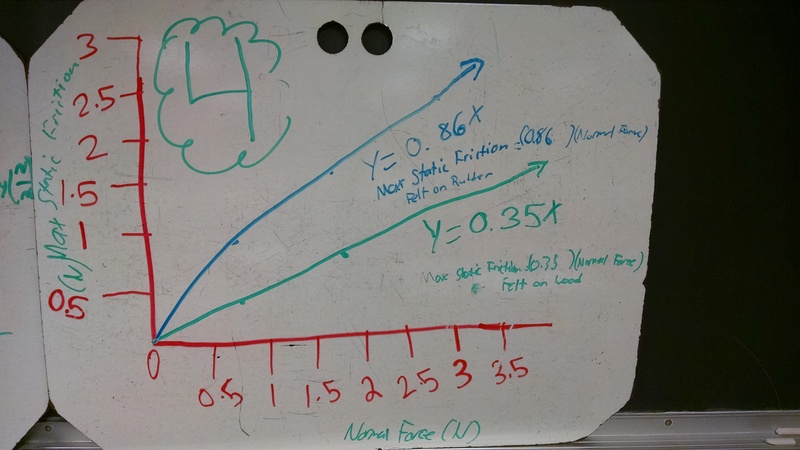 Then used the grip factor to extrapolate to how much friction there would be when we’re wearing our shoes. Theoretically, the tug-of-war team that wins is the team with the most friction. 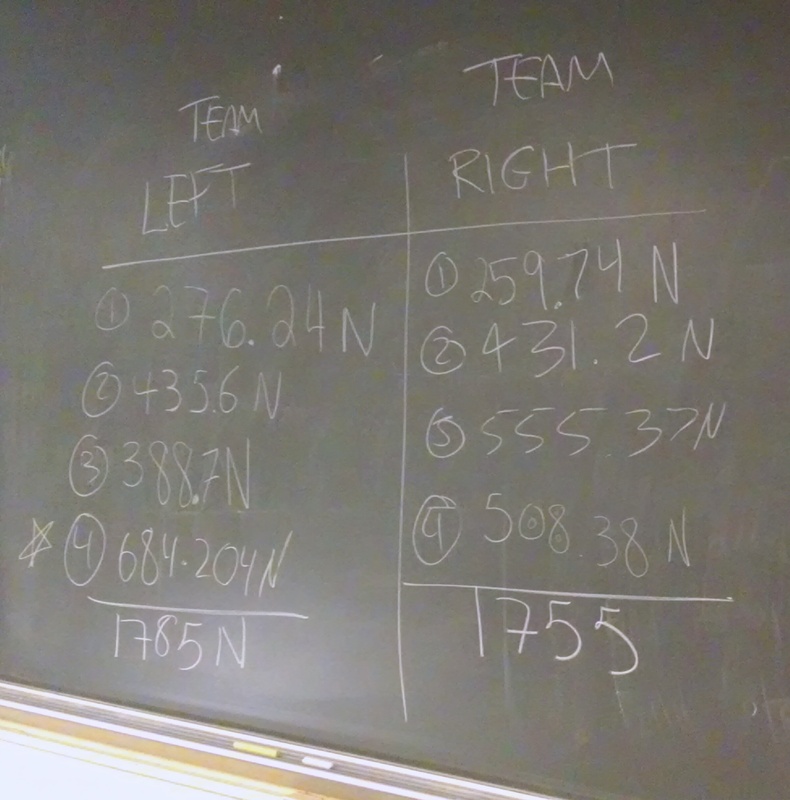 So we used the friction calculations of the students who wanted to participate in the tug of war to determine the winning team. Time to test our prediction! Day 38: Who Wins at Tug-of-War? 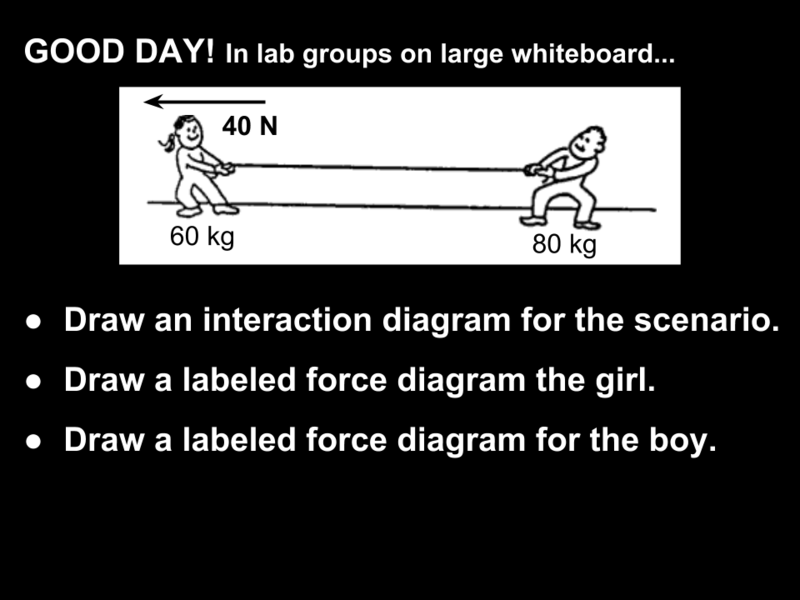 College-Prep Physics: Started off with this Do Now. So we test it out. Instead of roller skates, I have one kid sit on a cart. 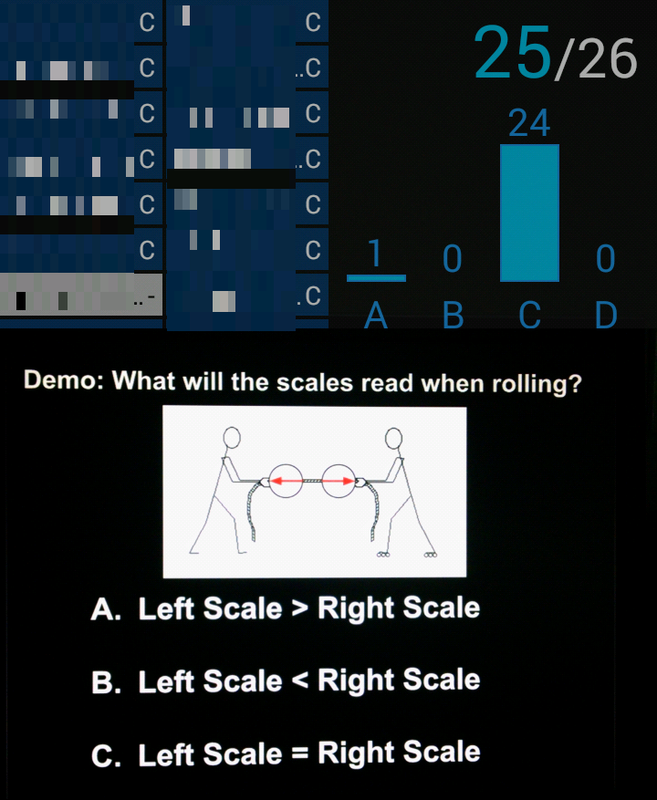 I set up a (spring scale)–(string)–(spring)–(string)–(spring scale) between the two people. Having a spring in the middle is nice because it allows the tension in the string to slowly change as the kid on the cart speeds up. Then I send the kid on the cart back and the spring/strings slow the kid down gradually. And the WHOLE time, the scales read the same. And it makes sense to them now, because they think/visualize the rope as one long spring than stretches and maintains even tension throughout. And when one person pulls harder, the whole string/pulls harder. The spring stretch/compresses evenly along its length. We don’t see one end of the spring stretched out more than the other end. 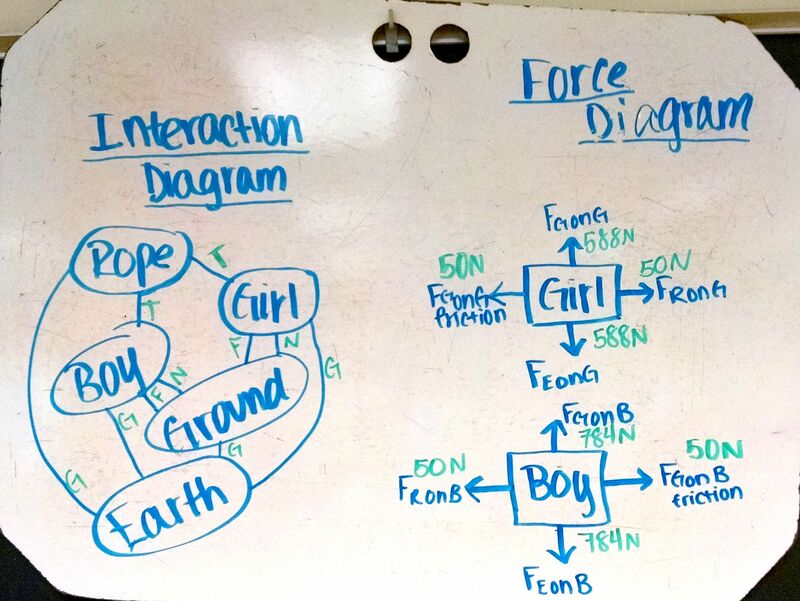 So then we modify our diagrams from before. 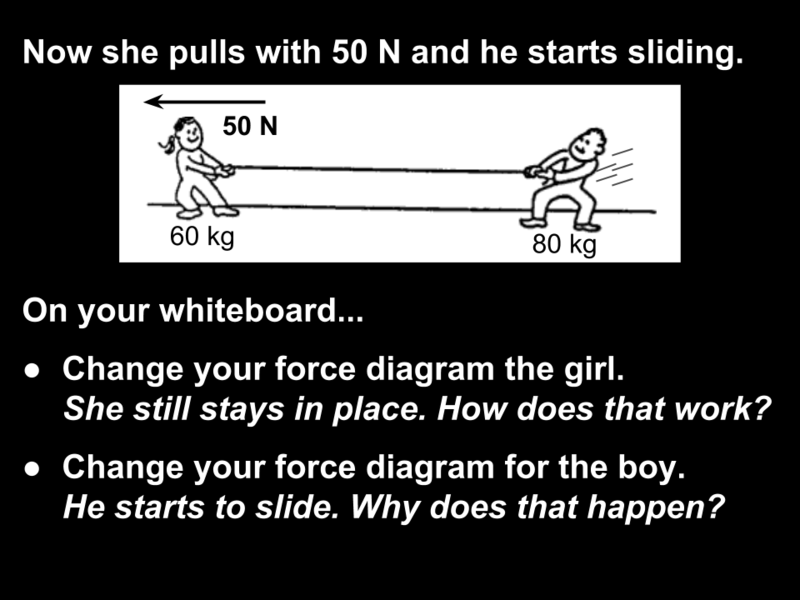 And then we watch a few tug of war movies I found from another physics teacher who posted them on his class website, paying close attention to friction (or lack thereof). 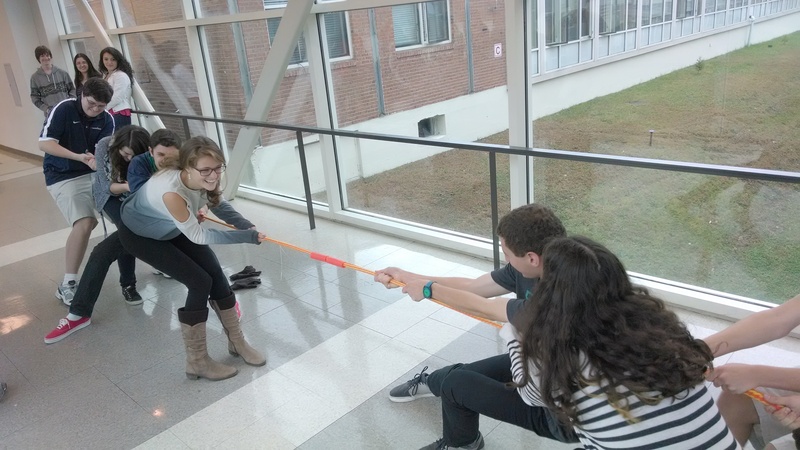 Day 41: Tug of War! 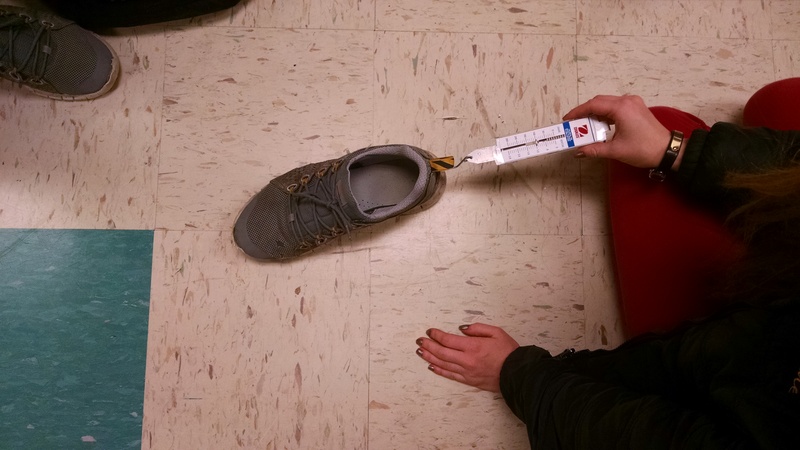 College-Prep Physics: Based on our shoe friction graphs from yesterday, students predicted the amount of friction between their shoes and the floor when they are wearing their shoes. 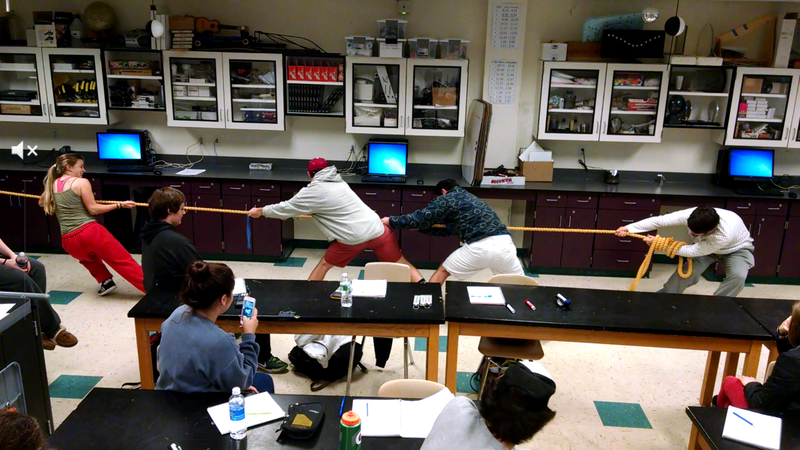 Then 1 person from each of the 8 lab groups was assigned to a team for tug-of-war. 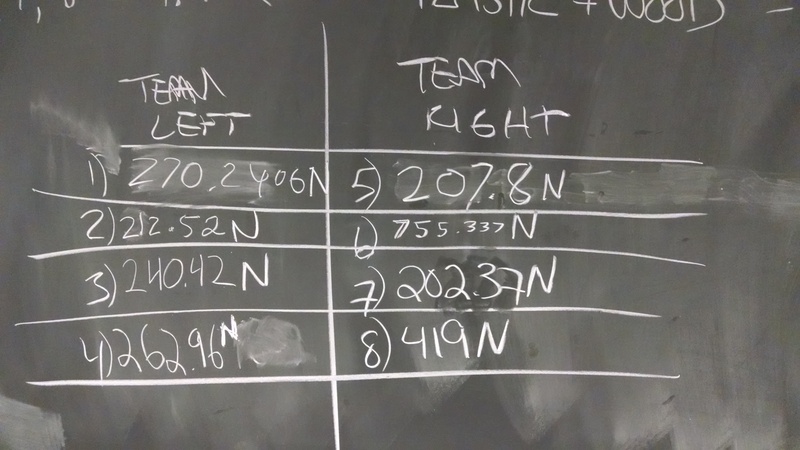 We tried to predict which team would win based on our estimates for friction. As you can see, it was really too close to call! Day 38: Who Wins at Tug of War? 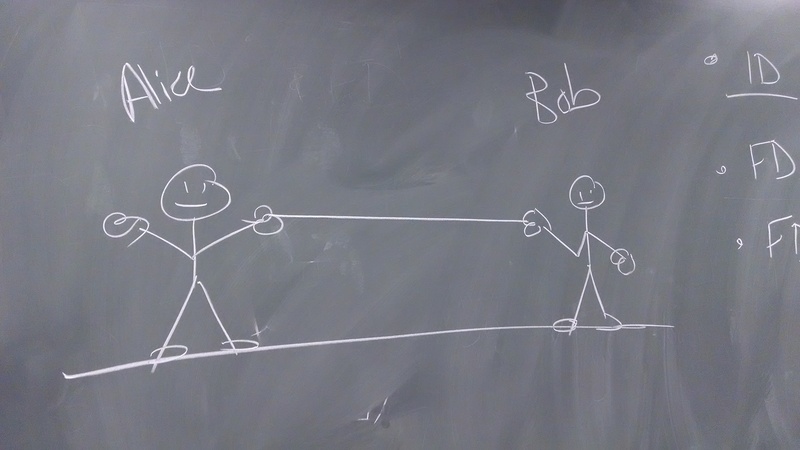 College-Prep Physics: Alice and Bob are playing tug of war. 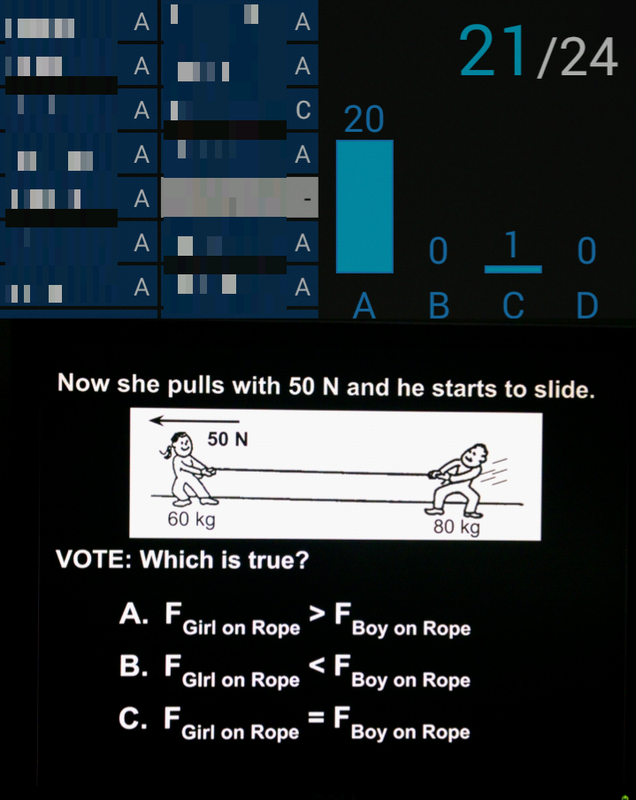 Based on our study of tension, we know the tension in the rope is the same throughout, which means the pull on both Alice and Bob will always be equal. So then how does anyone win at tug of war? What would happen if Alice was on roller skates (or my rolling chair) instead? What if Alice and Bob were both on skates? Or on ice? Then we watched several tug of war videos. Does the losing team go flying forwards due to the pull of the rope or does something else happen? Why is tug of war so difficult on a slip-n-slide? How does the person on the the right cheat?